Trattoria Rusticana is an haven of rest surrounded by the woods of the Reno valley. It offers the best specialties of the Bolognese cuisine like hand-rolled pasta paired with main courses of game. 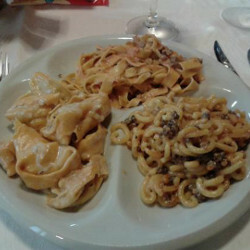 The entrées range from the “traditional” tortellini, tagliatelle and tortelloni to the “specialties” of maccheroni al torchio alla Rusticana or the various dishes made of game, such as the deer sausage gramigna, the ravioli of pheasant “alla parmigiana”, the tagliatelle alla cacciatora and the roe deer tortelloni. The main ingredient of the second courses is game: deer, boar, quail, duck breast and roe deer or traditional meat such as sausage, mutton, turkey and beef. The Trattoria Rusticana is surrounded by a huge park and a small lake with a lot of animals.